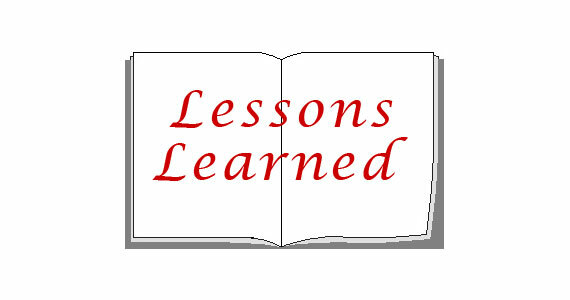 In case you’re wondering about the title, yes, I’m still talking about lessons I learned in 2011. I know it’s almost the end of February, but I am still reaping the benefits of having learned such profound lessons and it’s really becoming enjoyable to master them. Last year I struggled a lot with these lessons, but for good reason. I have finally gotten to a place where “I get it” and that feels good. I see the effects of having learned these lessons playing out in my life and it makes me appreciate all I went through last year to learn them. So without further ado, here is Part 2 of my Lessons Learned (in case you missed Part 1, click here to see the first half). Lesson 4: Live a life of gratefulness. I use the phrase “live a life of gratefulness” because it refers to a deeper concept than simply saying thank you for things or being grateful in the moment. When you truly begin to become grateful for everything, even the difficult situations… When you challenge yourself to stop complaining and learn how to appreciate your life for what it is… When you can just look around you and be grateful for the little things all the time, that is living a life of gratefulness. It takes a lot of dedication, awareness and discipline to stay grateful more often than not. I am definitely still in the process of mastering this lesson, but I am miles away from where I used to be. I truly know what it means to live in gratefulness instead of just tapping into it occasionally, and it just makes for a happier, more content existence. Lesson Learned: Sustained gratefulness is life’s elixir. Sometimes we don’t do what we’re supposed to do. It’s ok. Sometimes we are not at our best. That’s ok too. No matter what, we are always deserving of love and blessings. That’s just the way of the universe. I think because I’ve been such a judgmental and critical person for most of my life (against myself and others), it’s really taken me a while to grasp this universal lesson. I recently realized that the judgement I’ve always lived with was actually passed down through several generations in my family. So I’m not such an awful person after all! This flawed mentality actually came from somewhere. When you are able to look back and see where things come from and why things are the way they are, it takes the pressure off and allows you to take the whip off of your own back. Learning to let myself be, let others be and know that we are all enough just as we are is definitely one of the biggest and best lessons I have ever come across. Lesson Learned: Acceptance is the best self-love and universal love you can give. Lesson 6: The path to God is personal and customizable. Piggybacking off of the previous lesson, one of the things I used to beat myself up for is swaying from my spiritual practice. If I did not meditate or journal or read spiritual texts as often as I thought I was supposed to, I would feel guilty that I’ve slacked off. Luckily, my relationship with God has grown so much that even when I didn’t do those physical things, I was in constant communication with God, praying inwardly that He would continue to speak to me, give me clarity, and show me my truth. Because of my willingness to stay open and always hear from God, no matter what I was doing, I consistently got the exact messages I needed. I would get them anywhere… Watching TV, having a great conversation, taking a shower, washing the dishes, literally anywhere. It made me feel good to know God was reaching me where ever I was. He customized my walk with him and spoke to me in all kinds of different activities, even in some of my favorite things, simply because of my willingness to stay open and in connection with him. That makes my heart smile just thinking about it. 🙂 Lesson Learned: Relationship with God is more important than rituals and tradition. Share your thoughts in the comments: Can you relate to any of these lessons? What is your experience with them? What are your favorite lessons from 2011 and even 2012 so far? Did you enjoy this post? Stay updated by clicking here to subscribe with your email address or news reader so you don’t miss out! Was excited to read this post and to discover this blog – so much so that I put a link to it from my blog. My company name (though not used much publically) is In-Lightened Enterprises – because I fully believe that all of life is an inside out job AND that the answers to everything in life can be found within. I even distinguish between coaching and mentoring and call myself a mentor because most coaches I know tell you what to do and hold you accountable (a good practice), but a true mentor calls the answers forth from you and encourages accountability as part of your own integrity. Very uplifting and inspirational lessons learned. I think if you have been able to learn those lesson you will positive outlook in life and inner peace. 🙂 Thanks for sharing! That’s my goal Nicole, thanks! Of all the times I could have visited your page I’m glad today was the day. Your words truly inspired me this morning and put a little pep into my steps. Your last lesson was the one that holds the most truth to me. There is something “special” about staying open to God all night and all day. I used to laugh at myself because the deepest revelations always came in my sleep (while my conscience mind was tapped out). Now, it is cool to experience God’s still small voice nearly anywhere. Thanks for an on-point lesson. -This is more than blog, this is ministry! Jermaine Donaldson recently posted..What Will YOU PAY To See Your Dreams Come True? Beautiful post as always! I love all your comments and what I’m particularly working on this year is remembering to include God in everything I do all day long. This isn’t always that easy because I tend to get sidetracked and absorbed in the project of the moment, but I’m definitely improving and, fortunately, He doesn’t expect perfection! Sandra McLeod Humphrey recently posted..Liebster Blog Award: 5 Blogs You Should Check Out! I just found your blog and started reading & love it already. Very inspiring and beautiful post. Enjoyed reading it! I love “sustained gratefulness is life exlir”…perfectly stated. These are wonderful lessons that I’ve learned and on occasion. I need to be reminded. Thanks for the reminder. Thanks Coretta. I need the reminder too! Wow! You learned a LOT in 2011, Alexis. In comparison, I feel pretty dumb. Like most of us, I try to learn something every day that will make me a better person. And my relationship with God is an important part of my life, too. I think that one important thing I have learned is to be nice to everyone because you never know who someone will grow up to be. You’ve obviously grown up to be someone who sets the bar pretty high. I’m impressed. This is a great statement. If many, many more believed (allowed others to believe?) this simple maxim, the world would be a better place… It seems that today one must be painted as either ultra-traditional or an atheist, another unfortunate side effect of our highly polarized society…. These are extremely awesome lessons Alexis. There is nothing compared to living a grateful life. It just seems to build up our joy on the inside and causes us to just always give thanks, in our actions and reactions. The good thing is that you don’t have to be extremely rich and successful before you radiate all-round gratefulness. Accepting ourselves for who we are is one of the greatest gifts we can ever get. It gives us a sense of self worth and confidence. The is no one way method of connecting with God. God speaks to us in different ways and methods. Sometimes, knowing that He can speak to me at any time gives me the assurance of a smooth day. These are powerful lessons and I know more lessons are still to come. Lanre recently posted..Are You an Obsessive Fan or a Strategic Player? Thanks so much Lanre. Excellent insight as always. I love this, “The good thing is that you don’t have to be extremely rich and successful before you radiate all-around gratefulness.” That one principle has given me so much joy and contentment in my life.